Established in 1999 NextGen has a long history in online casino games. With offices in London, Sydney and Stockholm they create innovative software and outstanding slots for a truly global audience. 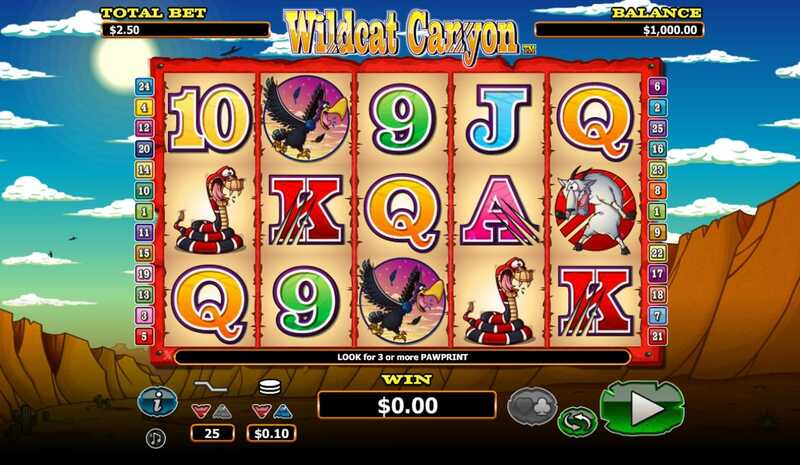 There might be a wildcat stalking the canyon, hissing and attacking all that gets in its way but don’t get in a spin, this all action game is ultimately a 5 reel slot and all the features will behave as you would expect. Despite the prowling wildcat this entertaining game is a good bet for unearthing some desert treasure. The naughty cat has been attacking some street signs and there’s lots of clawed letters and numbers to find on the reels. Find three to five of A, K, Q, J, 10 or 9 and you’ll get between 5x and 250x your stake. Get your hands on 5 cactus or 5 snakes and you’ll be rewarded with 500x times that stake, 5 goats will reward you with 1,000x and 5 buzzards 5,000x. Multipliers that are not to be sniffed at. 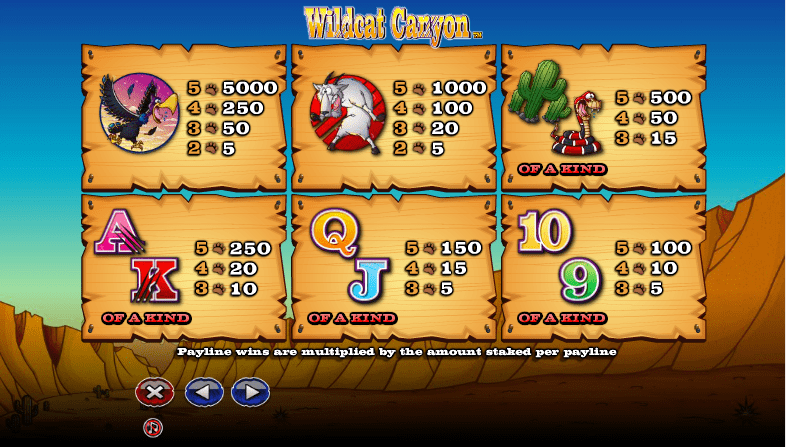 Staking options are varied, and entirely up to you to choose what suits your tactics, which makes Wildcat Canyon a great online slot for newbies or seasoned players. You can stake anything from 0.01 coins up to 2.0 coins and there are 7 lines options 1, 3, 5, 10, 15, 20 and 25. All this means a minimum bet of 0.01 coins and a maximum bet of 50 coins per spin. Paw-print - Get tailing that wildcat by looking out for these sneaky paw-print symbols. If you find 2 to 5 of these then your winnings will be between 2x and 200x your stake – 3 paw-prints will also trigger a free games feature. Free game feature - this free game feature offers a choice of 15 free games with all prizes tripled, 10 free games with all winnings x5, or 5 free games with all winnings x10. Wildcat – The cheeky little wildcat is the one to look out for. First up he may make an appearance on reels 2 and 4, and here he will substitute for all symbols except the paw-print scatter. During free games wildcat re-spins can trigger and all wildcat symbols will hold whilst the other reels are re-spun.